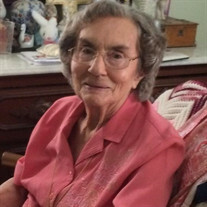 Olive H. Hudler,age 94 of Rutherfordton, NC, passed away on Thursday, August 2, 2018, at her home. She was a native of Bearsville, NY and moved to Rutherfordton, NC in 2013 to live with family. She was born in Kingston, NY on May 14, 1924 to the late Reuben Shultis and the late Emily Nehr Shultis. She was a graduate of Kingston High class of 1941. Olive went on to attend Spencer Business School in Kingston. She worked a short time as a secretary, but spent most of her working life as a caregiver for elderly individuals and of course her family. She married Edgar Hudler in 1942 moving to Mt. Tremper where she lived until recent years. She was a faithful member of Faith Bible Fellowship Church in Chesnee, SC where she leaves many friends. She was an avid gardener and loved to read. She was always very busy cross-stitching for family and friends. She was preceded in death by her husband Edgar Hudler in 1994. Laurie Hudler Hoy and her husband Richard. Henry W. Hudler and his wife Marlene. Glenn Hudler and his wife Nancy. The family will receive friends from 2:00 PM to 3:00 PM, Sunday, August 5, 2018 at McMahan's Funeral Home. A service to celebrate Olive's life will be at McMahan's Funeral Home Chapel at 3:00 PM, Sunday, August 5, 2018 with Reverend Timothy Teed and Reverend Raymond Shreve officiating. Memorials may be made to Faith Bible Fellowship Church; 625 Cooley Springs Road; Chesnee, S C 29323.